I recently contributed to the article on MRC’s Cup of Joe Blog called 7 harmful business dashboard mistakes. I’ll excerpt a version of what I said below, but you should follow the link to read the whole thing. (I’ll use the original version I sent to blog so as not to compete for search keys.) I’ll also add two more. So here they are, three common dashboard mistakes that organizations make. This is the process of placing everything on a dashboard because you are either unsure of what stakeholders truly want or because you want to make everyone happy. Either way, the result is usually a confusing mess. Dashboards that attempt to be everything to everyone become nothing to anyone. BI vendors have convinced us flashy, three-dimensional charts will save our businesses but data visualization research suggests they hurt more than help. Stick with the charts you know and avoid the stuff that looks complicated and self-indulgent. Dashboards aren’t marketing material; they don’t need to flashy, glitzy, over-the-top, or manipulative. So many business start dashboard projects only to spend 80% of their energy on researching and integrating a new BI platform and 20% on the dashboard itself. Those numbers ought to be the other way around. Dashboards are a business case, not a technology project. When we treat their development like a technology project, we face the budget and schedule overruns so familiar to IT departments. It’s been a while since I last posted and there’s some interesting stuff going on. I’ll be teaching a two-day short course at the University of Cincinnati on analytics with Excel. This will be my third time teaching at the University of Cincinnati center for Business Analytics. These classes are among my favorite to teach, and I always have a great time. If you are in the area, make sure to sign up. I’ll be speaking at the PASS Business Analytics Conference again this year. Click here to see my profile and register! 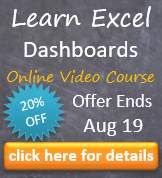 I’m currently developing an online video course in Excel modeling and analytics. I haven’t really come up with a catchy name yet. But I’m very excited about this project. I expect to be complete sometime this summer, but if book writing is any indication of my ability to stick a schedule, it might be the end of the year! Anyway, this will be a great course. Stay tuned! Oh yeah, buy my new book, Dashboards for Excel. This entry was posted in Dashboards, Data Visualizations, Discussion on February 1, 2016 by Jordan G.
I’ve been guilty of number 1 on your list numerous times. It just feels good to have everything in there in case the execs ask lol. You’re so right though the sheets get bloated and ugly. The more concise you are with understanding what your audience wants, the better you’ll be able to deliver a finished product that answers the business metrics or problems it was originally intended for. To be fair, I’ve been guilty of it too – that’s how I know the problem exists. (Also, you have to imagine when I complain about things, I’m really just complaining about myself.) The reality is that the first one in particular is very hard to control unless you work for yourself or basically you have free reign in an organization. There’s so much pressure to give everyone what they want often at the expense of the fundamental purpose of the dashboard. But I think having it in mind going in allows you to at least mitigate its potential. Yeah, absolutely. I’m sure you would see it even more often jumping from client to client. I agree just being cognizant of it should help in doing it. I honestly feel like you need to be too even for my own purposes. I let things get out of hand all on my own – thinking about what other questions and problems the dashboard can solve as opposed to only building it to solve the original problem/question.